Steak! Steak! Steak! 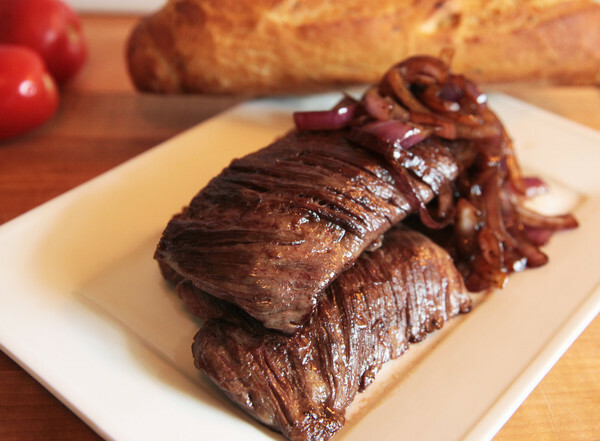 We absolutely love how tender this skirt steak comes out. How tender? Tender like our hearts. Awwww. Set the Sous Vide Professional™ to the 138°F / 59°C, with rear pump flow switch closed and front flow switch set to fully open. Season skirt steak portions with kosher salt and coarse ground black pepper. In a vacuum bag, place seasoned, trimmed portion of steak with 1T bacon fat (or olive oil), thyme and shallot. Vacuum seal. Do NOT use dairy products, such as butter, in cook times exceeding 4 hours. Fast Method: Place sealed steaks in circulating water bath and cook for 90 minutes. At 90 minutes, drop the circulator temperature to 122°F / 50°C. You may speed this process by adding several cups of ice, one cup at a time until temperature reaches 122°F / 50°C. Hold for 30 minutes. Do not hold longer than 1 hour at this lower temperature. Slow Method: Place sealed steaks in circulating water bath and cook for 16-24 hours. If serving immediately, drop the circulator temperature to 122°F / 50°C. You may speed this process by adding several cups of ice, one cup at a time until temperature reaches 122°F / 50°C. Hold for 30 minutes. Do not hold longer than 1 hour at this lower temperature. Remove the beef skirt steak from vacuum bag. Dry off with paper towel or kitchen towel. On a hot grill, sear skirt steaks until browned or charred, if desired. Beef will require very little resting time. After 60 seconds of rest, beef may be sliced and plated.